Made In China — But Was It Made In A Prison? : Parallels Prisoners in China's re-education-through-labor camps make everything from electronics to shoes, which find their way into U.S. homes. U.S. efforts to stop their export have met with limited success. 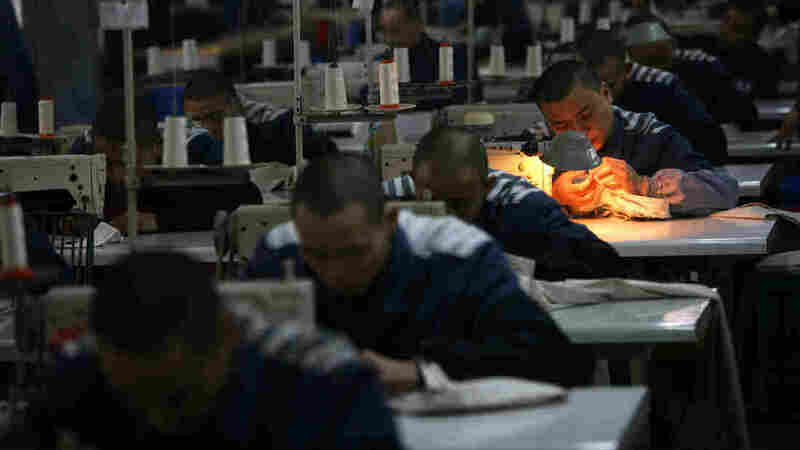 Inmates work on sewing machines at a prison in 2008 in Chongqing Municipality, China. said last year that it had halted programs of reeducation through labor camps. An Oregon woman was looking at her Halloween decoration last year when she found a letter written by an inmate from one of China's re-education-through-labor camps. The letter spoke of brutal forced labor in the camp. It was the latest in a series of incidents dating back to at least to the 1990s in which Chinese prisoners in such camps smuggled out letters in products assembled for export to the U.S. Early last year, China said it was abolishing these camps, as NPR's Frank Langfitt reported. And though the U.S. maintains a list of goods made by forced labor in China, including electronics, shoes and clothes, these products still find their way into the U.S. — and American homes. The U.S. government is trying to address the problem, says Ken Kennedy, the director of the forced labor program under the U.S. Immigration and Customs Enforcement. Progress, however, has been limited. Still, there have been successes: In 1992, a U.S. company paid a $75,000 fine for knowingly importing machine presses that were made in a Chinese labor camp. In 2001, a Chinese manufacturer pleaded guilty to producing metal clips with forced prison labor and paid a $50,000 fine. 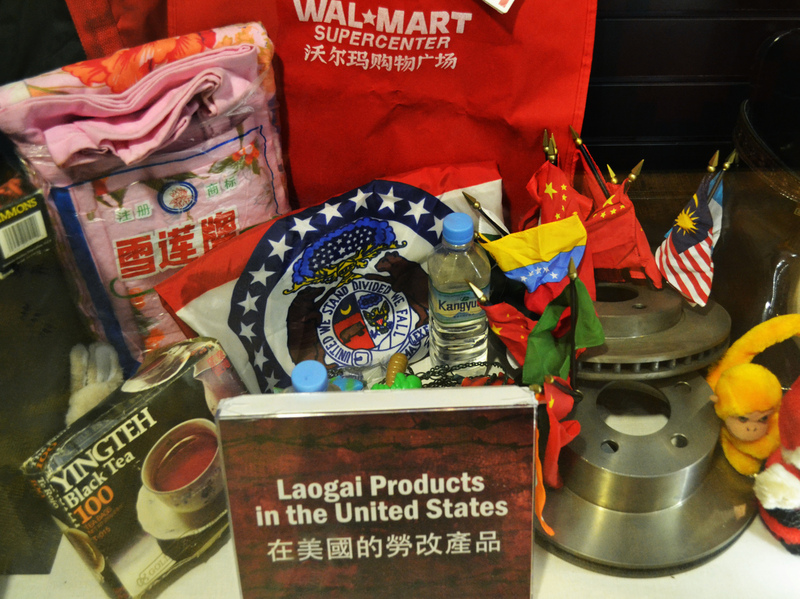 Products produced by prison labor in China are on display at the Laogai Museum in Washington, D.C. The U.S. has tried to ensure that China abides by its own laws that ban the export of products made by prison labor. But proving the origins of such products is difficult and requires the cooperation of the Chinese government. Labor camps usually have a sister factory with a different name located in the same place — and it's unclear how many camps or factories there are. In some cases, products produced inside the prison are labeled with the name of the factory, making it difficult for U.S. officials to start investigations. If a product is suspected of being made by prison labor, ICE sends information to the U.S. Embassy in Beijing, which in turn sends a request to the Chinese government to visit the camps. ICE's Kennedy says Chinese officials are supposed to reply to their requests within 60 days, but it takes at least five years, usually 10, for any feedback or permission for a visit. According to the data last updated by Laogai Research Foundation, a human rights nonprofit, U.S. officials have made around 20 visits since 1992. Kennedy notes that when U.S. officials do visit, the camps sometimes no longer exist. China's decision to end its re-education-through-labor camps doesn't make investigations easier. Camps can be renamed and continue producing goods. "The main limitation is the Chinese government," Kennedy says. "Without being able to visit the location and getting the approval one way or the other, we are basically hamstrung in our investigation." Besides, these camps are just one part of China's incarceration system, and they're not the only sites suspected of continuing to make products for export. U.S. laws also leave room for this type of trade. The U.S. Tariff Act of 1930 prohibits the inflow of goods made with any types of forced labor, but it has a "consumptive demand" exception, which allows goods, even made by prisoners, to be imported if they are short in supply in the U.S. Efforts to plug this loophole have failed. Last March, Sen. Max Baucus, D-Mont., now the U.S. ambassador to China, introduced a bill to close the exemption. It died in the Senate Finance Committee. A separate 2005 law to protect trafficking victims is the only legislation that directly combats forced labor products. It requires the Department of Labor to publish an annual list of products produced by forced labor. The current list has 35 products made by forced labor from 26 countries. But ICE's Kennedy said the 2005 law is focused on prosecuting those who force people into labor. "They are not interested in the commodities that the person was forced to produce," he said. In the early 2000s, Claude d'Estree worked in the U.S. Attorney's Office and proposed rules that required businesses to regulate forced labor in their production processes. D'Estree, now director of Center on Rights Development at the University of Denver, says businesses thought the rules were too costly and hard to accomplish. "It's a very hard sell," he said. "This is an uphill battle." Indeed. The 2010 Dodd-Frank legislation imposed disclosure requirements on U.S. companies for, among other things, if products contained conflict minerals. A similar legislative effort in 2011 that would have required businesses to file annual disclosures about conditions of forced labor or human trafficking in their supply chains died in the House Committee on Financial Services. D'Estree says it's not as hard for companies to comply as it seems. "The reality is that the corporate[s] complains a lot, but they [can] just impose the standard down the supply chain," he said. "It sounds like a huge imposition. I'm not convinced in reality it is." And, he adds, there seems to be less interest from the U.S. government to fight the issue. "What I have seen is a widening gap between rhetoric and resources," d'Estree said. "There is less and less real resources to either understanding it by research or actually effectuate any kind of positive change." Jeffrey Fiedler, a commissioner of the U.S.-China Economic and Security Review Commission, echoed that concern. "If the U.S. uses intelligence resources to discover companies in prisons that are using forced labor, and then ban those products from coming to the U.S.," he said, "that's the only real way it's going to change."